Although the 2012 hurricane season is not yet upon us, this is the time where we do need to see if any tropical systems might form. For a week or so, the GFS runs have been showing a system that might for in the western Caribbean, but lately the runs have backed off any development for now. Convection could be enhanced by a pulse from the Madden-Julian Oscillation (MJO) which should be in that area some time in very late May and into the early June time frame. Other models are calling for a much slower progression of the MJO. So for now, we will just have to see if any development were to happen. At the moment, for several days now, several models were suggesting that a surface low would develop along the south-eastern coast of the US as a trough “splits”. 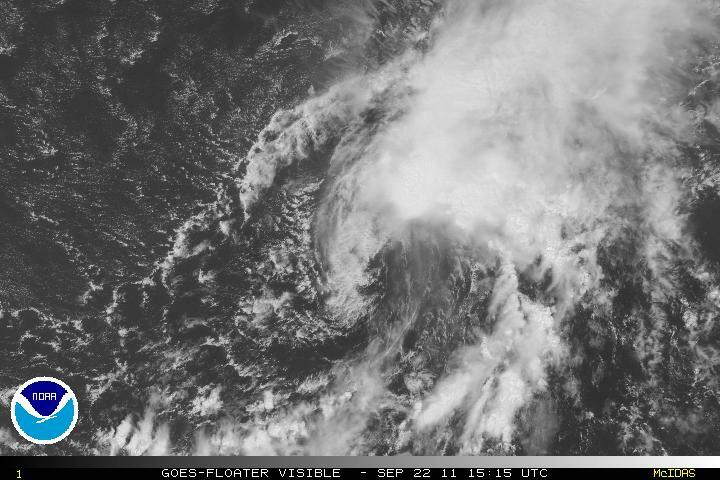 The low has developed and is now over water and Invest 93L was called up. 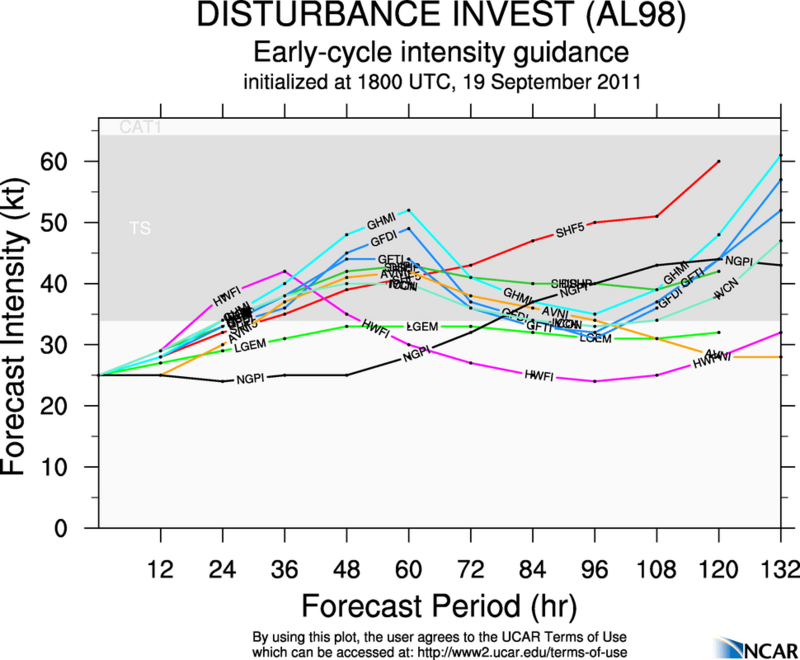 Although the models did not support any tropical development, but “surprise” Tropical Storm Alberto was declared at 5PM. There is some shear but that is forecast to abate some. TS Albero is also have a lot of dry air intrusion in the eastern and southern quadrants. As TS Alberto heads west or southwestward, some of the dry air may diminish but the biggest problem for Alberto is a new low to the northeast. This low should begin to constrict and not allow any further development. Earlier during the day, the system was tilted and the mid-levels of the circulation were being left behind but that seems to be no longer the case. TS is expected to drift SW then turn NE with just a possible close brush near North Carolina. The storm itself is very small and this should just keep the storm to as nothing but a rain event with a few areas of tropical storm winds. 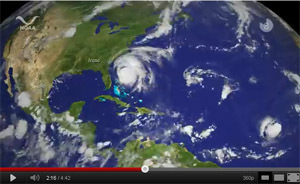 This is the time to start preparing for the 2012 Hurricane season. Have all your supplies and plans ready just in case. Don’t wait till until a storm may be headed in your way. Earlier this month sunspot AR1429 which was the source of several strong solar flares and geomagnetic storms is beginning to reappear after a two week trip on the other (backside) of the sun. While on the backside there was a least one X class solar flare. Solar flares are ranked by strength using five categories: A, B, C, M and X. 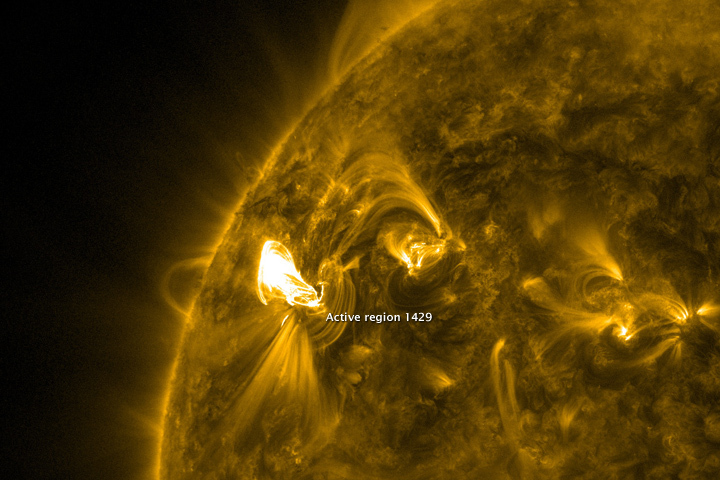 With the return of sunspot AR1429, this region seems to be very active. 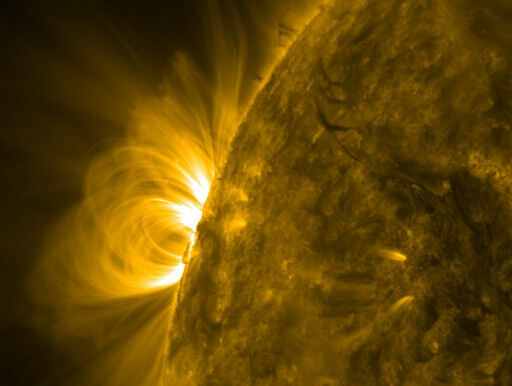 In the image below, magnetic loops towering over the sun’s NE limb signal the sunspot’s approach. NASA’s Solar Dynamics Observatory (SDO) earlier today photographed huge plumes of plasma rising and falling over the limb of the sun (See the video below). Also, Two C category solar flares, a C5 and C7, also erupted creating an enormous magnetic canopy causing waves of ionization to ripple through the high atmosphere. If this continues, sunspot AR1429 may once again create havoc with satellites in orbit which may interfere with satellite communications or damage power grids on Earth but also allow the beautiful green aurora’s near the Earth’s poles. Two major solar flares erupted March 6th, the most powerful solar eruption this year. Both of these flares are ranked as type X-class storms. X-class is the strongest type of solar flares that the sun can have. Solar flares are ranked by strength using five categories: A, B, C, M and X. The ranking system (similar to the Richter) so that category is 10 times stronger than the one before it. A B-class will be 10 times stronger than an A-class, a C-class would be 100 times stronger than A-class, etc. The categories are also broken down into subsets, ranging from 1 to 9, to pinpoint a solar flare’s strength. Only the X-class solar flares have subcategories that go higher than 9. The first solar flare was an X5.4-class flare after erupting at 0002 March 7 GMT and the second one occurred about and hour later and was an X1.3. The X5.4 solar flare erupted from the giant active sunspot AR1429, which also was responsible for the major sun storm earlier this week. Earlier this week, several M-class and C-Class eruptions had been noted. Prior to this week’s eruptions, an X-class eruption occurred on January 27, 2012 with a ranking of X1.7. In the image above, the solar flare is the brightest spot at the upper left.Several of the sun-watching observatories noted the huge clouds of charged particles called coronal mass ejections (CME’s) erupting from the solar flares. Data from the Stereo-B spacecraft is not sufficient to determine if the cloud is heading directly for Earth but most likely not, but a glancing blow to the Earth’s Magnetosphere is possible on March 8th or 9th. If any X-class solar flares were aimed directly at the Earth, the X-class solar flares can endanger astronauts in the International Space Station. They can create havoc with satellites in orbit which may interfere with satellite communications and major problem could be to damage with power grids on Earth. 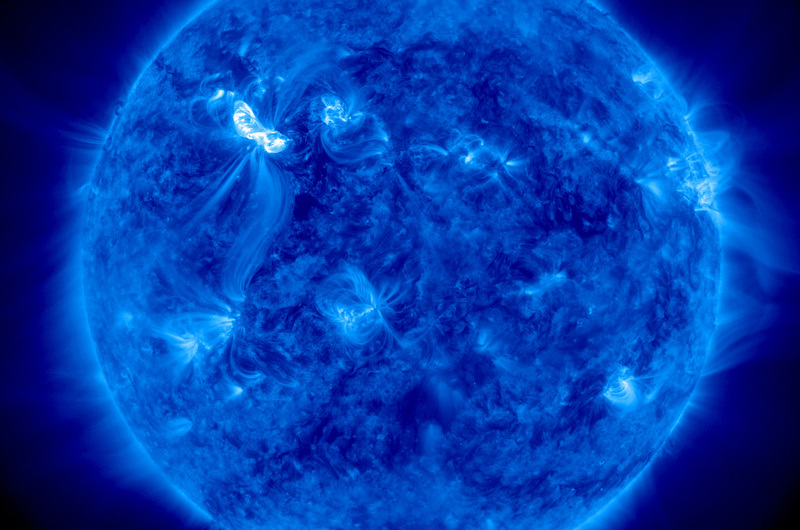 The Sun is currently in an active phase of its 11-year weather cycle. The current cycle is known as Solar Cycle 24 and is expected to reach its peak level of activity in 2013. Tomorrow will be the official end of the hurricane season for 2011. Irene was the only storm that hit the US landfall, but it was wakeup call in the sense that the Northeast US doesn’t normally won’t be affected by a hurricane, especially a possible major storm but it can happen. + A post-storm upgrade of Tropical Storm Nate to hurricane status, and the addition of a short-lived, unnamed tropical storm that formed in early September between Bermuda and Nova Scotia. This unnamed storm, along with several other weak, short-lived named storms, could have gone undetected without modern satellite technology. The remnants of Ophelia has been getting better organized over the past two days and the remnants of Ophelia has been entering in an environment that is more conducive and as of the 5PM Advisory yesterday, Ophelia has regenerated to Tropical Depression Ophelia. 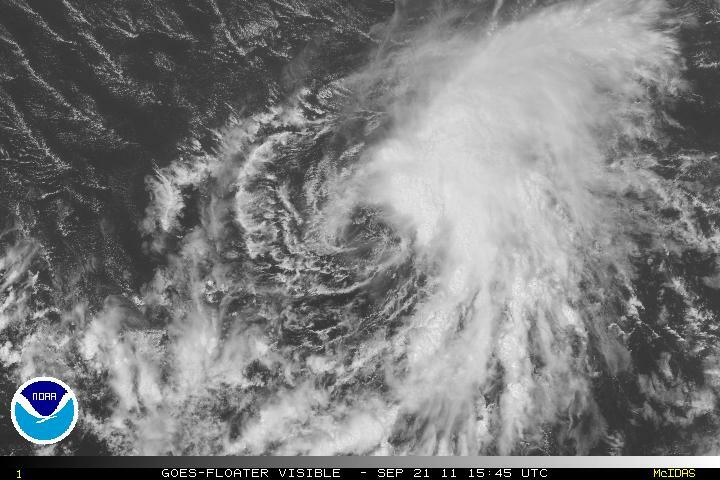 Satellite imagery along with reconnaissance did indicate that Ophelia had finally developed a closed surface circulation. The upper level winds that sheared ex-Ophelia to a remnant low has relaxed and along with some warm SST’s, the regeneration of Ophelia did seem imminent. As of the 11AM advisory today from the NHC, Ophelia was upgraded to Tropical Storm Ophelia. Although Ophelia has been been wobbling, a north-northwestern track is now forecast. As Ophelia continues to head north-northwest, later during the week a very large trough will be over the eastern CONUS and eventully in the western Atlantic. The trough will turn Ophelia north and possibly turn slightly north-northeast and hopefully enough to keep the storm away from Bermuda. Intensity is difficult to forecast as there is still shearing west of the center but possibly just enough of a favorable environment to make hurricane status later in the forecast period. Tropical Storm Philippe is being affected by western shear and the low level of circulation is exposed with all the convection east of the center. Although the forecast originally was for Philippe to head north then northeast, the forecast models have changed. At the moment, Philippe is heading west-northwest but as Philippe approaches the western periphery of a ridge, a turn to the northwest is forecast and should continue for the next few days. A very deep trough that picked up Ophelia will now have pulled up and this trough will be moving eastward and the subtropical ridge will be filling in this will now have Philippe heading on a westward track for several days and there is even a chance of a west-southwest track. Shear may eventually decouple the storm and can still be hang on as a tropical storm a second trough will be over the central US but probably will pull before it reaches Philippe but this should cause a weakness in the subtropical ridge and allow Philippe to turn north and then a sharp turn to the northeast. If Philippe degenerates to a remnant low, the remnants will not be head north but stay on a westward track. Elsewhere in the tropics, the MJO is still forecast to in the western Caribbean and the upward motion is still signaling some type of development in that area in nine or ten days. Although the MJO was supposed to be in the area of the western Caribbean some time ago, it was delayed and all indications are the MJO will be there this time. Tropical Storm Ophelia – A Little Stronger?? Tropical Storm Ophelia overnight intensified slightly to 65 MPH. The intensity was basically due to a reporting NOAA Buoy 41041 that had peak (one minute) sustained winds of 54 knots and a gust of 68 knots. Whether this is indicative of a trend or not, it is still impressive how tenacious some the storms this season has been so far. Strong 25-35 knots of southwesterly shear along with some dry air that is wrapping around the outer core continues to keep the convection well east and northeast of the center of circulation. The center of circulation again is visible from satellite presentation due to the strong shear will be present for the next 36-48 hours. Assuming Ophelia can continue tropical storm status, most of the global models are in agreement of an upper level trough later in the forecast period that might weaken the ridge slightly which might allow the environment for Ophelia to a bit more conducive and allow some strengthening. For me, I am not convinced that strengthening will occur even with the weakening of the ridge, at least not in the short term. Guidance is in good agreement for Ophelia to begin the turn west-northwest, probably tomorrow afternoon or sooner, and the turn to the northwest sometime late Sunday. Ophelia will be near the southwestern edge of the subtropical ridge and the turn to the north is forecast sometime early next week. 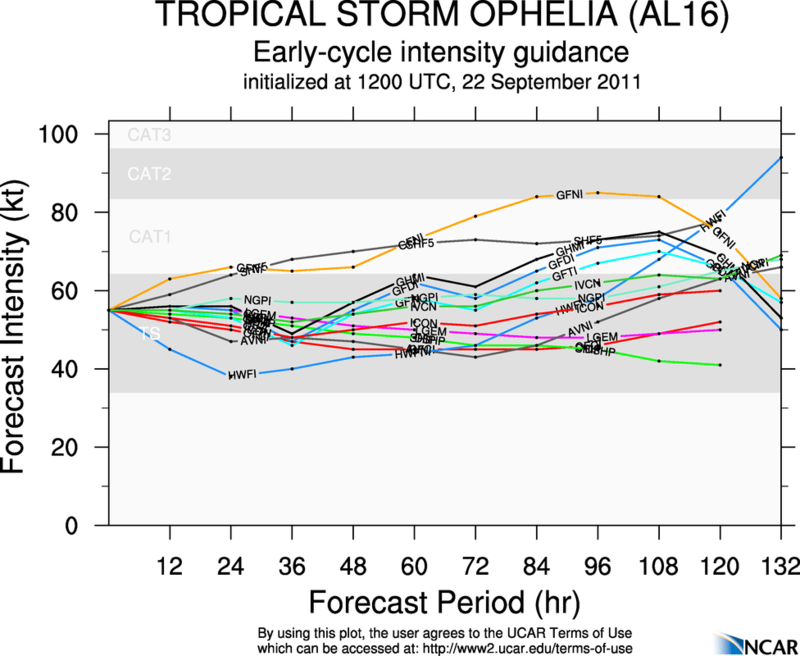 Intensity is always difficult to determine, but I do not believe Ophelia will make hurricane status. Invest 98L has been upgraded to Tropical Storm Ophelia as of the 11PM advisory last night from the NHC. 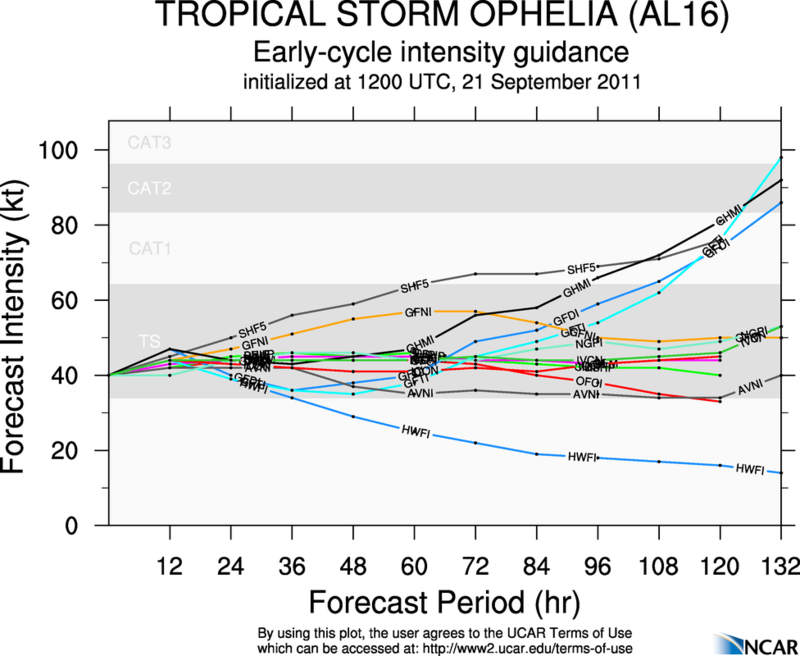 Due to strong westerly and southwesterly shear, Ophelia will struggle and any increase in intensity will be gradual. At the moment, the LLC is exposed and all the convection is to the east of the center due to the strong westerly shear. Ophelia is south of a subtropical high pressure ridge. For the next 36-48 hours Ophelia will be heading westward or just north of due west, after that the forecast is for a deep layer trough to dig down as it heads off the eastern coast of the US. Ophelia will be on the southwestern periphery of the ridge and the trough will turn west-northwest then northwest. Eventually, the trough will turn Ophelia north and then northeast. 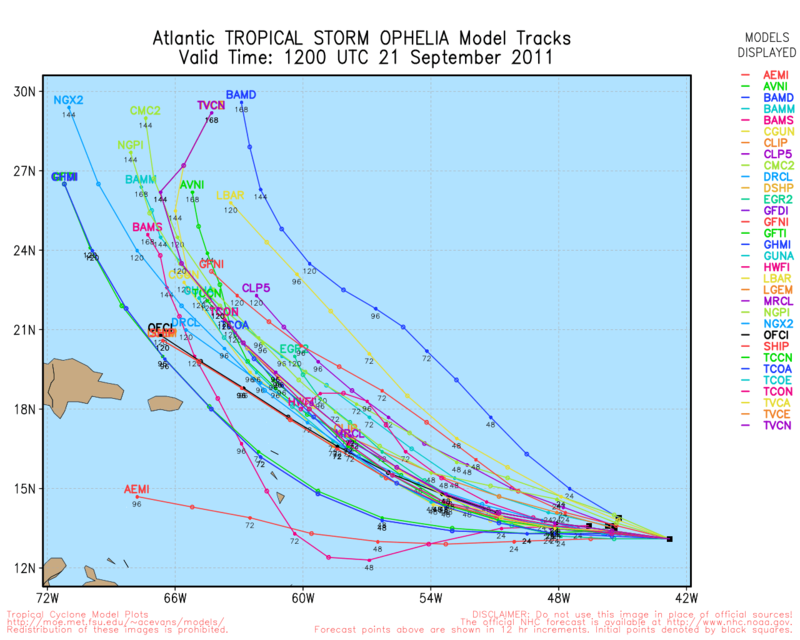 Before Ophelia gets close or near the northern Lesser Antilles, shear may relax a little and allow some strengthening. Once Ophelia begins to get close to 60°W longitude, shear is forecast to strengthen significantly and at that point, further intensity will be difficult, if not impossible. Once Ophelia begins the northern turn, the upper level winds may begin to ease and allow some more strengthening, but that is part of the long term forecast – so the dynamics may change. 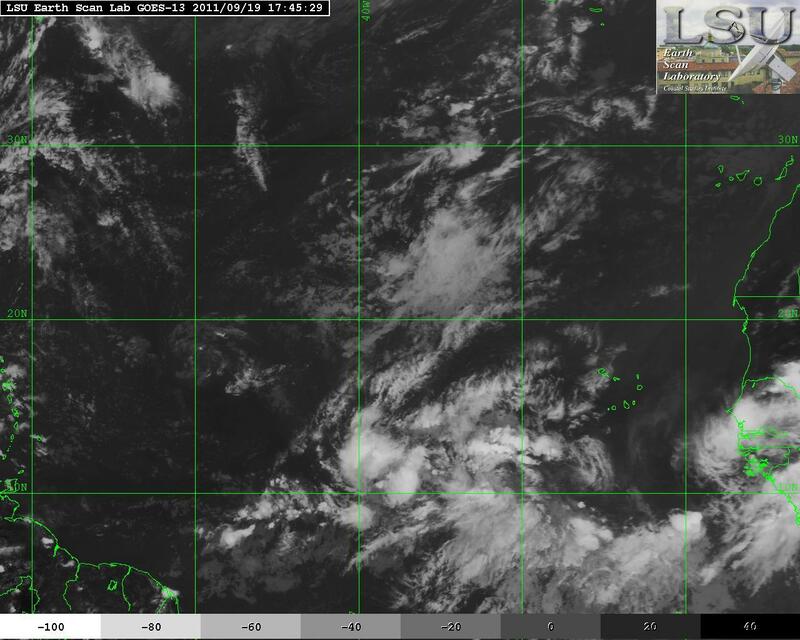 The tropical wave tagged as Invest 98L about 1400 miles east of the Windward Islands has continued to develop and is much better organized than yesterday. Conditions are now much more favorable for the few days 98L may develop into a tropical depression possibly as soon as tomorrow. Most of the major players in the global models guidance are in agreement for Invest 98L to develop as a tropical storm as it continues to head westward and eventually into the eastern Caribbean. That said, both the European and the GFS models do want to weaken 98L possibly to just a tropical depression, mostly due to a ridge of high pressure that is forecast to strengthen along with increasing shear. This should cause 98L to accelerate it’s forward motion leaving the convection behind and eventually decoupling whatever is left of 98L back to just a tropical wave. Dependent on what is left of 98L and also what the track guidance will be, regeneration may or may not occur. If 98L continues it’s westward track and can pass through the “graveyard” (an area near Hispaniola hostile for storms) somewhat intact, as it gets to 75°W longitude there is the slight chance, of regeneration, albeit very slim. More likely than not, 98L will not track westward but a more west-northwest and affecting the Leeward Islands and possibly Puerto Rico, although it would be more of a rain event than a wind event due to the shear. Tropical Storm Maria, a resilient storm with maximum sustained winds of 50 MPH (a decrease from yesterday of 60 MPH) continues to struggle despite all it going through. 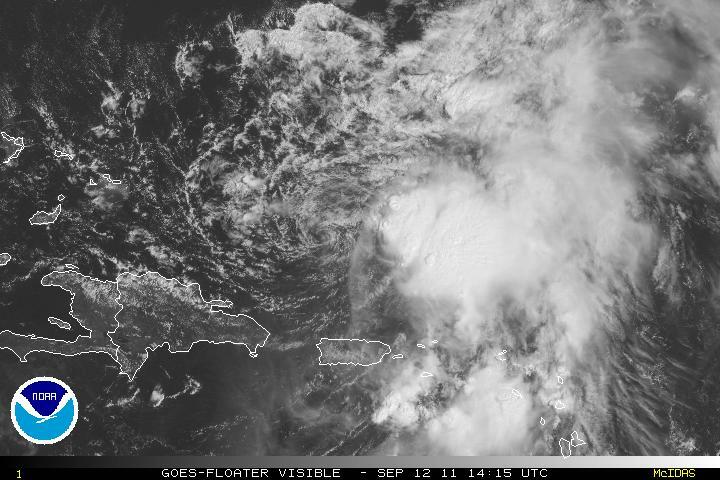 Again, the convection is to the east of the center of circulation and satellite presentation shows the “naked swirl”. Maria is again heading westward but at a turtles speed of about 1 or 2 MPH. Whether this is the beginning of the turn or not is to early to tell. Due to the westward movement, models tracks have been shifted slightly to the left of the original. An upper-level low to the northwest of the storm is creating 20-25 knots of westerly shear and not allowing Maria to better organized. The shear is forecast to decrease slightly in a few days which may allow some gradual strengthening but this is for a short window of time. A sharp increase of shear is forecast and along with some of the upwelling from where Hurricane Katia’s track was will keep Maria in an unfavorable environment and limit further intensification, if any. The global models are in very good agreement as to what track Maria will take. A mid to upper level trough which is currently over the eastern US will slowly begin to turn Maria to the north in about 36-48 hours. Another trough, this one much deeper and stronger, later during the week will eventually turn Maria to the northeast along with an increase in the forward speed. Elsewhere in the tropics, a few of the models (long term) are hinting that some tropical mischief may appear somewhere between 10 – 14 days most likely in the mid to western Caribbean or the Gulf of Mexico. The MJO does show upward motion (in green) in that area during those time frames. We will have to see if anything does develop. Tropical Storm Maria is just barely hanging on enough to still be classified as a Tropical Storm. 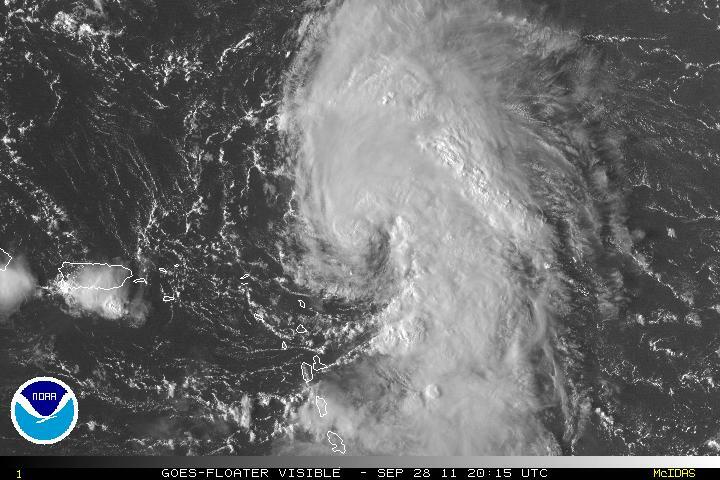 The center of circulation is well east of the convection and the entire storm is elongated. Maria started to make the more true WNW direction yesterday and now a NW direction. A few days ago, the forecast for the ridging of the subtropical high in the Atlantic was to strengthen and keep Maria a more WNW track. As of yesterday, it appeared that the ridging was not going to be as strong. Maria will soon be near the southwestern side of the ridge and due to an approaching trough to the southeast US coast, Maria will be heading NW and eventually a turn to the north is forecast. The track guidance confidence within the models seems to be very high and when that usually happens, 95 percent of the time it is correct. At the moment, there an upper level low to the NNW of Maria and the flow from the ULL (SW shear) along with some flow from a high to the east of Maria. The combination of the two is inducing a hostile environment for further development for Maria. The ULL is slowly moving away to the northeast and the shear levels will be reduced allowing some strengthening within 24-48 hours and eventually enough for Maria to become a hurricane later on in the forecast . Although the track guidance is very clear, intensity will be a problem. Category one hurricane status seems to be foreseeable as long as Maria does develop but I don’t believe a category two storm is probable, but I don’t want to rule it out either. Overall, the Leeward Islands and possibly Puerto Rico may have tropical force winds, but since all the winds are in the area with the convection which is east of the center, this most likely will not happen but those in that area should monitor just in case . The Bahamas this time seem to be spared but any westward movement could allow some higher winds to the the Bahamas and although it is highly unlikely, the Outer Banks of North Carolina. Tropical Storm Nate which for days was somewhat adrift has finally been tracking almost due west toward Mexico. Tropical Storm Nate who was drifting for those days has had problems with both dry air intrusion and the depths of the ocean there is somewhat shallow, upwelling also seemed to keep Nate from strengthening. As Nate is heading away from the cooler waters, further strengthening should occur. Due to the bowl shape of Bay of Campeche, convergence may help Nate in strengthening for a short period of time before land interaction will stop further intensification. Nate at the moment is in an environment of low shear and Nate may intensify enough to become a hurricane not to long before landfall. Once landfall begins, Nate will begin to lose it’s strength and identity as it heads into the mountains.